Did you know that every Tuesday Stampin' Up! releases new downloads for My Digital Studio? I'm really excited because this week, they've released one of my favorite stamp sets in digital format - Creative Elements! This is such a gorgeous stamp set. 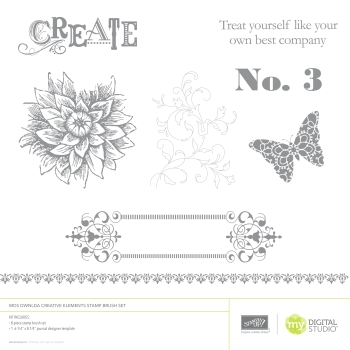 And when you purchase the download, you also receive a template for a designer journal template - it is gorgeous! Check it out here. There are also several other downloads that were released today. I've been enjoying lots of time with MDS lately. I love this program it is incredibly versatile, so easy to use and PERFECT for gift giving ideas. With Christmas coming, now is the time to get started on your digital crafting - consider making calendars (desk or wall), albums with your favorite photos from the last year or a swatch book for family members. So many options! And guess what - beginning in October, there is an exclusive hostess-only digital ensemble that is perfect for making holiday projects and gifts that you are going to want to get! Contact me to book your workshop today. Order your digital downloads or other Stampin' Up! products from my online store.